Consider yourself to be something of a chocolate aficionado? You’ve tried chocolate cafes, tastings, boutiques… all that’s left is the factory where all those tasty morsels are created. Chocolate factories scattered around Australia and New Zealand afford your taste buds the experience of a lifetime. So where better to begin than Dunedin, home of Cadbury World in NZ? Picture this: one tonne of pure melted chocolate, flowing down five storeys. No, it’s not a scene from Willy Wonka and the Chocolate Factory – this is what awaits Cadbury World visitors is in its pièce de résistance; the affectionately named Purple Silo. Many a visitor has been known to stand transfixed before the mouth-watering sight, and, although it’s a case of ‘look but don’t touch’, you will get to sample luscious liquid chocolate at another point in the tour. There are a few tours you can choose from, varying in duration. The Full Tour runs for 75 mins – over an hour of chocolaty goodness! – and is available only on weekdays. Cadbury World is a real, working factory, so the Full Tour encompasses the chocolate-making process from cocoa bean to end product. We’re told that New Zealanders consume 40 million Easter eggs every year – taking the factory six months to make and only 1 week to sell! Of course, you’ll receive a goodie bag at the beginning of the tour, and, as you are guided through the manufacturing areas by that tantalising chocolate smell, you’ll be treated to some delectable chocolates (and a real cocoa bean). Little known fact: the tour includes a visit to an outside platform with spectacular views of the city and the Otago Peninsula. 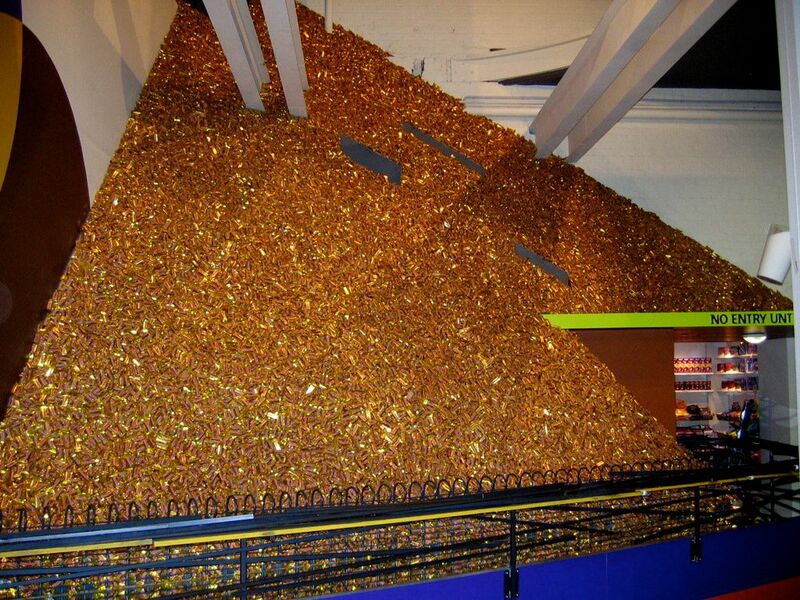 A wall of Crunchies at Cadbury World! The history of chocolate from the Aztecs to Easter eggs – you’ll be a positive expert by the time the tour is finished. Don’t forget to take pics with the vintage purple Cadbury trucks! There’s also plenty at Cadbury World to entertain the little ones on school holidays … although you may have to steer clear from the Cadbury shop at the end of the line. Have you visited Cadbury World in Dunedin? What did you think? Any other choccie factories you’d suggest? Leave us a comment below. Suggested itinerary: Fly in to Dunedin Airport. Once you’ve finished taking in the city’s sights, drive to Wanaka, with a stopover at Queenstown. Stay at Wyndham Vacation Resorts Asia Pacific Wanaka. Plan ahead! Bookings are essential.